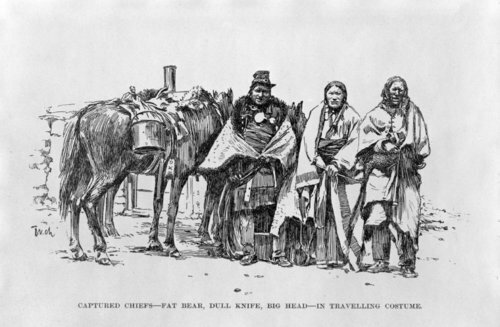 This is an illustration of captured Cheyenne chiefs identified as (left to right) Fat Bear, Dull Knife, and Big Head. These men were held by Custer as hostages in exchange for the return of white prisoners. This drawing was copied from Following the Guidon. Funds for digitization provided by Mr. Steve Peckel in memory of William Chalfant.